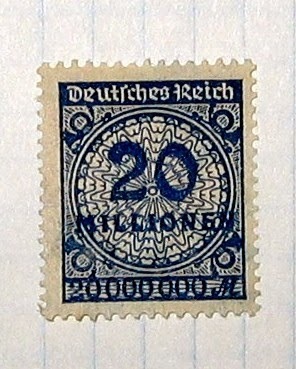 Among german stamps 20,000,000 German reichsmark stamp was issued on 1923-10-28 during the inflation period. This emission had 2 variants that you can see here. Type of printing was typography. German stamps during inflation period had a lot of enormous values because of the economic disaster. It is well known that the government was forced to print more money and the value of the mark begin to fall dramatically. Workers were paid a few times each day having off time to spend the income before its value vanished. They say that during the year of 1923 a piece of bread worth billion of marks and markets were empty. Between 1921-1923 about 200 varieties of german stamps were issued. The overprinting method was actual because the economic crash and the post office could not design new german stamps to keep up with the inflation. In anul 1875 s-a infiintat la Bucuresti, dupa modelul englez, Societatea Romana de Geografie sub presedintia regelui Carol I. In 1925 Societatea a implinit 50 ani de existenta. S-a hotarat atunci sa se bata o medalie comemorativa si sa se scoata o serie de timbre jubiliare. Atat medalia cat si timbrele n'au putut fi scoase in acel an. Timbrele tiparite in 1927 sunt de cinci culori iar pentru a aduce Societatii un venit din aceste marci, s'a hotarat cu aprobarea directiunii generale a Postelor ca la valorile initiale de 1, 2, 3, 5 si 6 lei cat are fiecare dintre cele 5 marci, sa se adauge la fiecare cate o suma care sa'i ridice valoarea la 10 lei. Marca de 2 lei este de culoare verde si are in ovalul din mijloc bustul lui Mircea cel Mare care isbutise sa stapaneasca Tara Munteneasca cu ambele maluri ale Dunarii, Dobrogea cu Silistra precum si tinuturile Almas si Fagaras.